Crianlarich stands at one of the great crossroads in the Southern Highlands of Scotland. If you head south from here you pass Loch Lomond en route to Glasgow, while if you head south east you pass through the Trossachs en route to Stirling and Edinburgh. Face the other way and you can head west to Oban, or turn north at Tyndrum for Glen Coe and Fort William. Almost everyone who has visited the Highlands will have passed through Crianlarich at one time or another. And in the centre of the village stands the imposing and white-painted Best Western Crianlarich Hotel. This is a hotel that is well worth breaking your journey for, as it offers good value accommodation and great public rooms combined with a wide range of extremely good food that takes in everything from snacks and sandwiches via bar food to fine dining. You can read our dining review for the Best Western Crianlarich Hotel here. The Best Western Crianlarich Hotel had its origins as a inn serving highland drovers taking their herds of cattle to lowland or English markets, and this or a predecessor inn was said to be a haunt of Rob Roy MacGregor in the early 1700s. The origins of the current building seem to date back to the early 1800s, but the hotel really hit its stride with the arrival of the railway in Crianlarich in 1873. The hotel continued to thrive with the coming of the motor car to the Highlands in the first half of the 1900s. In the 1970s it ceased to be a hotel open to passing members of the public, and became the first of a number in the area run by a company operating coach tours to Scotland. 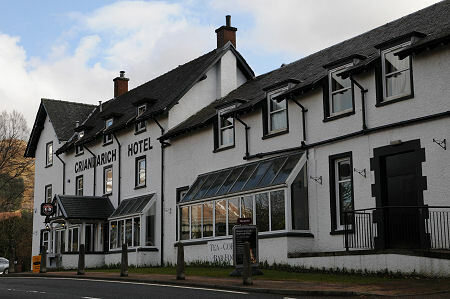 This resulted in a significant modernisation and expansion of the hotel, but did mean that some of us have driven past the Crianlarich Hotel for over three decades without ever setting foot inside. The chance to do so came when the hotel was relaunched under new ownership in March 2009. When we visited, the development of the hotel was very much a work in progress. Many changes had taken place since its opening the previous year, while others were about to happen or were being planned. Despite this, the public areas of the hotel were already looking very impressive. The slate walled and floored reception area provides an instant "wow" as you walk through the main door. Beyond it is a superb wood-panelled lounge area with a separate snug or reading/games room leading off it. Beyond again is the bar, comprising a small serving area and a very large main room, complete with wood burning stoves and reminders of the hunting heritage of the area. The dining room leads off the reception in the other direction. There are 36 en-suite guest rooms in the hotel, divided between standard and premier grades, and available as doubles, twins or singles. Rooms tend to be well sized, with even a single offering ample space. Many offer superb views north over Glen Dochart to the mountains beyond, or east over the village to the dominating presence of Ben More beyond it. All the east and north facing rooms also front onto either the A85 or A82, but the windows are double glazed and it is surprising how little used these main roads become overnight: so we didn't find traffic noise to be an issue. The character and setting of the hotel means it is becoming a successful venue for weddings, and the scale of the public areas means that functions and meetings can be accommodated up to quite large numbers of participants. Disabled access to the public areas of the hotel is quite good, with ramp access, a level ground floor, and disabled toilets. There is also lift access to the main accommodation floor, and improvements to pinch-points such as bathroom doors are planned to improve the accessibility of the guest rooms. The Crianlarich Hotel has been part of the scenery of our journeys though this part of Scotland for decades, and we approached our review visit to it with a mixture of hope and trepidation. In the event, our hopes were met and our expectations exceeded. Although it was still a work in progress at the time of our visit, enough had been achieved to see that the combination of new owners able to appreciate the hotel's potential and inspirational management able to deliver - and expand - that potential was moving the hotel quickly in the right direction. Add in excellent service from an enthusiastic and obviously committed team, and this looks very much like a winning formula. The Crianlarich Hotel need no longer be mere scenery on our - or your - journey to or from the Highlands: we will certainly be calling in again, and would recommend that you do so too. You can read our dining review for Best Western Crianlarich Hotel here.